The perspective of head protection industry has undergone an enterprising change in the recent years. Safety measures have become a vital axiom in the manufacturing sector, subject to strict regulations regarding workplace safety and the rising number of workplace accidents. Companies engaged in head protection industry, as observed of late, have been bending over backwards to establish strategic collaborations with their counterparts, in a bid to develop sustainable, cost-effective, and highly efficient & innovative products. An apt instance of the aforementioned declaration would be 3M’s recent acquisition of Scott Safety from Johnson Controls. Elaborating further, 3M, a formidable player in industrial head protection market, signed a strategic agreement with Johnson Controls that gives it the exclusive rights to purchase Scott Safety, a high-grade manufacturer of flame detection apparel & devices, self-contained breathing systems, and the like, for a valuation of USD 2 billion. Through this deal, 3M aims to strengthen its personal safety equipment portfolio by tapping into Scott’s amazingly innovative product range of safety equipment for industrial workers, military, security forces, and the like. Another notable instance that demonstrates the proactive levels of head protection industry giants is that of MSA Safety’s Globe Manufacturing acquisition. If reports are to be believed, the Pittsburg-based industrial head protection market player has successfully acquired Globe Manufacturing, a reputed developer of firefighter turnout gear. The deal has been closed through an all-cash transaction that amounts to around USD 215 million. The aforementioned instances depict a fraction of the developments underlining head protection industry, which, as analysts forthrightly presume, will surpass a valuation of USD 3.4 billion by 2024. Another essential factor that investors must take note of is that the dynamically changing trends in personal protective equipment market have been making a consequential effect on head protection industry. Class G (general) helmets are tested at 2200 volts. Class E (electrical) helmets are tested at 20000 volts. Class C (conductive) helmets do not provide electrical insulation. In 2015, the International Safety Equipment Association (ISEA) received the ANSI approval for the aforementioned regulation. The important updates that characterized this norm were that of providing additional protection to employees working in hot environments (60°Celcius, give or take a couple of degrees). ISEA further strengthened its regulatory coursework by aiding OHSA’s recognition of this updated standard for head protection, thereby further empowering the overall regulatory frame of reference for industrial head protection market. MSHA encompasses a PIB (Program information Bullet) that outlines the purpose of the key regulations - 30 C.F.R. 75.1720(d) and 30 C.F.R. 77.1710(d), that serve to provide complete protection to workers from falling objects, blows, burns, or electric shocks. Furthermore, hard hats/caps used for head protection must be painted with a non-metallic base and must strictly meet the specifications enlisted by the ANSI. These standards are liable to be complied with, under any circumstances. Construction, mining, and oil companies have been diligently following the same, thereby providing a positive impetus to head protection industry share. The buzzing trend of IoT has made its presence felt across major end-use sectors, head protection industry bearing no exception. The realm of technology has been encompassing a barrage of domains of late, pertaining to the ease of operation, high-grade efficacy, superior workability, and a plethora of contributing factors. 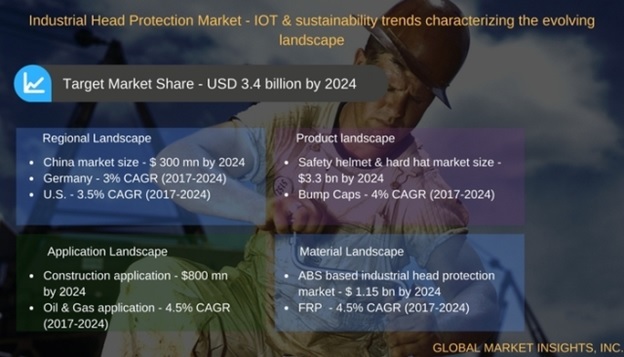 Envisaging its benefits, industrial head protection market players have been extensively deploying technology into their production modules, to generate advanced products as per end-use requirement and worker convenience. The UK-based construction company, Laing O’Rourke, has been exploring a new type of smart model that may bring about a revolution in the production of smart hard hats, with an aim to reshape the technology trends pervading head protection industry share from the construction sector. This model encompasses the usage of a sensor set mounted onto a sweatband in addition to a data collection unit that can be fitted onto the hard hat. The sensors here are used for temperature and heart rate monitoring of the worker as well as to scrutinize the external weather conditions such as temperature and humidity levels. The model is touted to be one of a kind, designed to warn workers when they are suffering from a heatstroke, and are likely to be commercialized soon in industrial head protection market. Australia has also been confronting new frontiers with respect to head protection industry. Recently, in Australia, the RMIT University has developed an innovative system that helps embed sensors onto safety helmets that can promptly inform workers of any impending danger. This product innovation comes as a respite for the construction sector, given that this sector is responsible for more than 21% fatalities (as per OSHA), and is reputed for the large-scale deployment of safety helmets and hard hats. Speaking of which, industrial head protection market size from safety helmets and hard hats is touted to cross 350 million units by 2024. Considering the data release from Safe Work Australia, the number of worker compensation claims was pegged at more than 27 per 1000 workers in 2002, while in 2014, the claims dropped to 17 per 1000 workers, depicting a decline of more than 30% in the fatalities occurring in the construction sector. These statistics affirm that the head protection industry in Australia stands much to gain from the construction sector in the ensuing years. Incidentally, a report by Global Market Insights, Inc., claims industrial head protection market share from construction applications to surpass USD 880 million by 2024. In 2014, the US-based firm Daqri conceptualized an Android-powered hard hat that was equipped with sensors, cameras, augmented reality, and a transparent visor as a head-up display. Without a trace of manual operation, this product has been enabled to depict digitized elements against real-world objects – a perfect example of IoT-powered equipment, defining the changing dynamics of head protection industry. Industrial head protection market has been increasingly leaning toward sustainability, given the ongoing trends of using eco-friendly products to maintain environmental safety. Currently, most of the companies use fossil fuel sources to manufacture protective headgear. However, pertaining to a stringent regulatory framework, head protection industry players have been striving to develop sustainable products to curb the carbon footprints across the globe. Fossil fuels are being replaced by natural fibers and biopolymers in order to develop recyclable products. Industrial head protection market players are now facing the twin challenges of using bio-based materials for product manufacturing, in tandem with making the product fashionable, efficient, and customized enough to suit the client’s demand. With more sustainable challenges on the cards, research and innovation programs are sure to increase, thereby augmenting head protection industry. MSA Safety, one of the global leaders in industrial head protection market, had developed a green hard hat a few years back, which was manufactured from sugarcane ethanol. MSA’s brainchild, the V-Gard GREEN hard hat was developed in Brazil, and was soon commercialized in North America, post its launch at the National Safety Council Congress & Expo in Chicago. Other head protection industry players have been following MSA’s lead since then, devising renewed business models, as the production of such green hats from sugarcane helps to almost entirely eliminate carbon footprints from the atmosphere. Industrial head protection market, in the last few years, has indeed traversed a path further along than was expected. The tremendous growth projected for the manufacturing, construction, oil & gas, chemicals, and mining sectors provides supplementary evidence that head protection industry is here to stay. The fraternity is expected to depict a slew of ever-changing trends, however, two key factors that this business is liable to be constantly characterized by are – the regulatory ground of reference and product differentiation. Companies partaking in industrial head protection market share, it has been observed, are fiercely adopting tried-and-tested as well as contemporary growth tactics to sustain their established position in addition to giving their rivals a competitive edge. This business is moderately consolidated, as analyzed by research experts, nonetheless, it has witnessed the entry of newbies that have been striving to carve out their space in this domain. Of late, head protection industry players have been working toward manufacturing customized products for their clients. In the light of the current scenario, with core companies diversifying their manufacturing methodologies, it would prove more profitable for companies to manufacture customized components. Besides, constant tech innovations coupled with periodic upgradations in regulations are certain to provide an arduous but interesting challenge for industrial head protection market biggies. In the years ahead, this business space is forecast to carve out a profitable growth map, with a projected valuation of more than 400 million units in terms of volume, by 2024.